Despite undeniable evidence that cell phone use is dangerous while driving, a shocking amount of drivers still text or talk while on the road. Sadly, these people not only put themselves at risk of a car accident, but also other drivers, passengers, and nearby pedestrians. 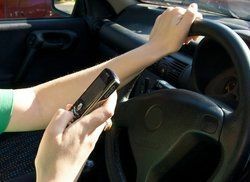 While new laws, campaigns, and technological devices are released each year to discourage this habit, distracted driving from cell phone use is still a palpable threat in Salt Lake City and other cities around the country. Refer to the information below to learn the true link between cell phones and auto accidents, and what you should do in the event you are the victim of distracted driving. More than 1 out of 10 drivers aged 18 to 20 who were involved in an accident were texting at the time of the crash. The widespread use of cell phones on the road is a scary prospect, especially when combined with the numerous other factors that may affect one’s driving, such as inexperience among newer drivers. Car accidents can result in significant vehicular damage and personal injury, leaving drivers and passengers with a financial burden as well. However, if an accident is not your fault, there is no reason you should have to pay for it. By working with an experienced attorney, you can prove that a distracted driver was in fact the cause of your accident, thereby awarding you compensation for your damages. Even if you were the victim of someone else’s negligent driving, you should not continue to be victimized by medical bills, car repairs, and other financial consequences. If you are injured in an accident due to a distracted driver, you should not be held responsible for any of the damages. Call our office to learn how to proceed, and receive the compensation you deserve.